Fasten your belt, pull down the roll bar and hang on! 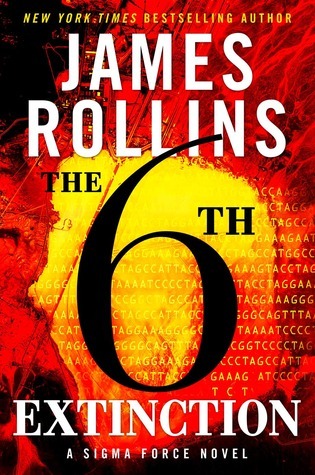 The 6th Extinction by James Rollins starts fast and then picks up speed, twisting and turning on a dime as it takes you on a ride into the science of biogenetics and the reality of mass extinction looming above us all. Rollins does not let up in this novel, the 10th in the Sigma Force adventure series. When help finally arrives they find everyone dead. Not only at the research station but for fifty square miles around. All life. Animal or plant. All dead. To confuse matters even more, there is a firefight going on the mountainside. A park ranger and her rescue dog are pinned down by a paramilitary group. She is rescued and the story she relates is even more frightening as the leader of the research station is kidnapped, taken alive before the station was breached. Only one group, Sigma Force, has the capability and scientific know how to unravel this mystery and fight off what may be a catastrophe up global proportions. A madman with an environmental agenda has gotten a hold of the most powerful virus on the planet. A virus no plant of animal has an immunity against. A virus which can be used to bring out the 6th Extinction. Rollins is a thrill writer and his novels move so fast that they are meant to be devoured over the span of hours, not days and not weeks. The 6th Extinction is no exception to this rule. It is fast. It is exciting and it is smart. Very smart. Rollins has stepped into the void left by the passing of Michael Crichton. There are shades of Andromeda Strain here but unlike most of Crichton novels, there is no dull interlude as the science is explained. Here the science is fast and furious. Bill Nye on speed dial. You will understand it and you will want to not believe it possible but like most truly frightening aspects of good fiction, there is a great deal of truth to it all. Another winner by a gifted storyteller at the top of his game.